You are here: Home / celebrations / best ideas / Capture a Photo Of Santa In Your Home! Capture a Photo Of Santa In Your Home! Thrill your kids this Christmas!! This post contains affiliate links at no additional cost to you. For further detail, please see our disclosure policy. Catch Santa in YOUR house! How will your kids doubt Santa when they see a picture of him in their very own home?!! This is such a cool idea and very easy to do. I uploaded images of my family room to the company’s website. I spent a few minutes choosing a Santa (there are hundreds to choose from). It took about 15 minutes to create – which includes a downloadable picture I printed instantly. Wow – I have PROOF of SANTA in my very own home! Here’s a Photo of Santa in front of our fireplace. I love his facial expression of being caught in the act! Santa in front of our Christmas tree. He’s probably checking his list to find out if we’ve been naughty or nice ; ). What a fun tradition to do every year and then look back on the different pictures!! Your kids will be talking about Santa visiting their home for years! This is how easy it is to do…..
How fun would it be to try and show Proof of Santa’s Visit in your home?!? Just before bedtime on Christmas Eve – have your kids help you set up your camera on a tripod or on a desk/counter. Mention to your kids if Santa appears the camera will automatically take his picture. Of course, if your child still believes…this will be easy to pass off. After the kids are sleeping, take the photo you really want to use and upload it to the company’s website. Make sure to delete the camera image – just in case your child looks at the camera (you don’t want an image of your family room on the camera without Santa in the pic). This site has several great features on this website – you can resize Santa, brighten, contrast, etc to make it look like he is really in your home. Print out the picture and show your family the next morning…what an awesome surprise. I wish my kids were young enough to pull this off. For $9.95 you’re able to do 3 different pictures. The account set-up will expire in one year – create 1 or 2 pictures this year and another next year. Great deal! To all of our readers…Merry Christmas!! Our regular blog posts will be back on track after Christmas. Capture Santa in YOUR Home! Capture A Photo of Santa In YOUR Home!! 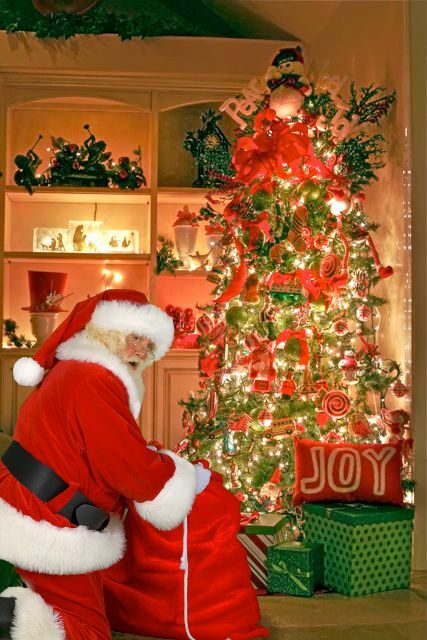 Thrill Your Kids-Capture a Photo of Santa In Your home!! I saw your last post on this and I uploaded my picture and I can't wait for my son to see it on Christmas morning!!!!!!! I'd love to see your photo!! I'm sure your son will be so excited to see a picture of Santa in his house. Thanks for sharing! I am reposting this over at Sassy Sites! And, of course, mentioning that it came from you! xoxo!! I have been reading your blog for a while now and it's one of my favorites. Looking forward to more of your great celebration ideas in the coming year. All the best for 2011! This is such an awesome idea. My children are all grown but I think I will do this for our grandchildren. I’m very excited to to do . Thank you for doing this for all us parents and grandparents. Thanks, Loa! I know how much I loved it and I’m an adult. Just imagine the little ones. Just don’t forget to do it at Christmas. Enjoy! !